For THE WHO fans everywhere, the announcement of a brand new tour means only one thing: the world's most untameable rock band is about to deliver the goods once again. Never ones for nostalgia, singer Roger Daltrey and guitarist and songwriter Pete Townshend will be unleashing the combustible force that is THE WHO, with symphonic accompaniment this summer and fall in 2019. 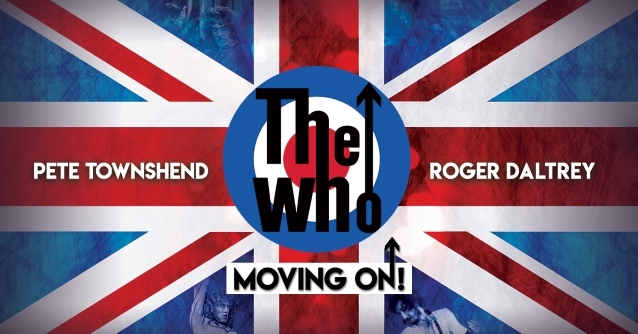 Produced by Live Nation, THE WHO's North American "Moving On!" tour will bring their indelible brand of powerhouse rock to 29 cities beginning in May (see tour itinerary below). The kickoff date is May 7 in Grand Rapids, Michigan, with the band wrapping up the first leg of the tour June 1 in Toronto, Ontario, Canada. A much-anticipated series of fall dates will launch on September 6 in St. Paul, Minnesota and conclude on October 23 in Edmonton, Alberta, Canada. Tickets go on sale to the general public beginning Friday, January 18 at LiveNation.com. THE WHO's fan club presale starts Wednesday, January 16 at 10 a.m. local time and runs through Thursday, January 17 at 10 p.m. local time. Every pair of tickets purchased online includes a redeemable code for a CD copy of THE WHO's forthcoming album when it's released. This offer is available to U.S. and Canada customers only and not valid for tickets purchased via resale. In addition, $1 from each ticket sold for the "Moving On!" tour will benefit Teen Cancer America. The tour is THE WHO's first return to the states since its 2017 Las Vegas residency. That same year they did a limited run of shows following 2016's rescheduled leg of their acclaimed 50th-anniversary celebration. The band also drew praise for their extended 2012-2013 North American run, a 36 city "Quadrophenia" tour with the band performing their 1973 rock opera in its entirety. Commenting on what WHO fans can expect on the 2019 "Moving On!" tour, Townshend stated: "THE WHO are touring again in 2019. Roger christened this tour 'Moving On!' I love it. It is what both of us want to do. Move on, with new music, classic WHO music, all performed in new and exciting ways. Taking risks, nothing to lose. Looking forward to seeing you all. Are you ready?" Commented Daltrey: "Be aware WHO fans! Just because it's THE WHO with an orchestra, in no way will it compromise the way Pete and I deliver our music. This will be full-throttle WHO with horns and bells on." THE WHO's music provoked explosive change and spanned what many critics declare is rock's most elastic creative spectrum, with Townshend's songwriting moving between raw, prosaic, conceptual, and expressively literate. Their visionary sense of stagecraft headed by Daltrey's soaring vocal prowess is topped off by the band's blistering rhythm section. With both Roger and Pete delivering their own memoirs in recent years (Pete's "Who I Am" was released to much acclaim in 2012, and Roger's autobiography, "Thanks A Lot Mr. Kibblewhite; My Story", was embraced by critics in 2018) it's fitting that the two remaining WHO members have shared their incredible legacy in literary fashion, for few bands have had a more lasting impact on the rock era and the reverberating pop culture than THE WHO.